This review is part of my fulfilment of an agreement with the editors of this text in exchange for a free advanced copy of this book. First of all, the chapters were too short for my taste, but this was an introduction geared towards probably laypersons. Okay, fine. I get why the brevity. Still, some ideas need to be explicated. My other dislike about this text was that it severed completely, as Dirk von der Horst said, discussions of oppression and suffering from God’s relationality. 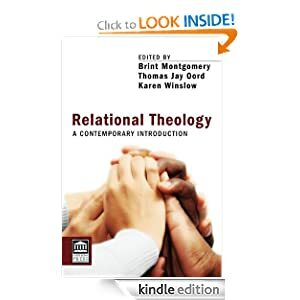 In fact, probably the fact that this conversation is a white Protestant male lead book on relational theology is part of the reason that the work of Catholic feminists such as Elizabeth A Johnson’s work is overlooked significantly. We can’t talk about God relating people without talking about God’s suffering with persons in specific contexts, i.e., gender, race, and class injustice. One of the more problematic essays in this collection, “Worship As Relational Renewal And Redemption of the World” by Brent D. Peterson is probably an example of what happens when male relational theologians turn a blindeye to suffering. This essay is very problematic with the claims it made, and in only FOUR pages! First, Peterson ignores significant biblical texts in the Jewish canon where God accepts sacrifices (animal and produce), and where YHWH punishes for wrong sacrifices. But no no no no, Peterson argues, that “the Israelites‘ worship was inauthentic” and that it was like a “Wal-mart transaction.’ In other words, the rituals and ceremonies that Jesus himself participated had no meaning, that intentionality is something that God detests. This very brief but succinct argument is typical in white evangelicalism and white liberal protestantism. It is supersessionist, and anti-Jewish (not to mention a-historical). Peterson has privileged his (white) Gentile place above the Hebrews in his reading of the biblical narrative. Peterson goes on to argue that because God is relational, we cannot “earn healing” by caring for the poor. (There’s one major religion that argues this, I’ll let you take a guess, even though Peterson gets them wrong hint hint). “The church cares for the downtrodden as an act of doxology:thankful worship.” See, relational theology leads back to conservative political notions of charity. When you take away notions of duty (Christ’s commands, as well as all of the oh say relevant Hebrew Bible passages about justice), relational theology then become nothing more than a deity with a nicer image, smiling with the heart of Wal-Mart. This entry was posted in Political Jesus and tagged anti-Judaism, antisemitism, books, free will theology, relational theology, theology, theology books, Thomas Jay Oord, trinitarian, Trinity on June 8, 2013 by Rod T.